NEW ORLEANS – All-time charts weren’t safe this past weekend. Our National Athletes of the Week, announced Tuesday by the U.S. Track & Field and Cross Country Coaches Association (USTFCCCA), challenged history across the nation. Chris Nilsen went up and over a historic bar this past weekend. Nilsen cleared 5.86m (19-2¾) in the pole vault at the Howard Wood Dakota Relays to match Bill Payne, the fourth best performer in collegiate outdoor history. That clearance also tied Nilsen for the sixth best performance in collegiate outdoor history to boot. The sophomore from Kansas City, Missouri, entered the competition at 5.35m (17-6½). He went over that bar on his second attempt and only needed six attempts the rest of the way after that as he topped three bars on his first attempt, including the clincher. This is the second time that Nilsen earned National Athlete of the Week honors this season. He also received them on April 3 after winning the Clyde Littlefield Texas Relays. Gabby Thomas had herself a day at the Ivy League Heptagonal Championships. Thomas won five titles, including individual crowns in the 100, 200 and long jump. It was in the 200 where Thomas set a meet record with her time of 22.76 into a slight headwind. Perhaps the crowning moment for Thomas at Franklin Field, however, was her comeback on the anchor leg of the 4×400. Thomas got the baton down nearly three seconds and gave the Crimson the win by .04 seconds with her 49.44 split. This is the first time in her career that Thomas was named National Athlete of the Week during the outdoor season. Thomas earned Harvard’s first outdoor award since Courtney Smith in 2016. Nils Fischer posted the top javelin throw in NCAA Division II this past weekend at the Lone Star Outdoor Track & Field Championships. Fischer’s hurl of 76.48m (250-11) was good for an Automatic Qualifying Mark, but more impressively, it was the third-best mark in NCAA Division II history. No one else in the entire country had as long a throw as Fischer this past weekend, and the native of Germany has now run his unbeaten streak to three consecutive meets. This is Fischer’s second National Athlete of the Week honor this season, and third overall. Caroline Kurgat continued her already impressive junior season with an outstanding performance in the 5000 at the Payton Jordan Invitational. The native of Eldoret, Kenya, ran the third-fastest time in NCAA Division II history with a mark of 15:41.21, winning her section and besting a slew of NCAA Division I runners. She improved upon her own GNAC record in the event with her outing, and her mark was the fifth-best time on the week of any collegiate performer. This is Kurgat’s second National Athlete of the Week honor during this outdoor campaign, as well as fifth overall this year, as she picked up the honor three times during the cross country season. Before this past weekend, the last time a man cracked the NCAA Division III all-time chart in the long jump was 2013. The top-5 marks all happened before the turn of the millennium. Ta’riq Thomas changed all of that at the MAC Championships. Thomas soared 7.86m (25-9½) on his sixth attempt to PR by nearly two feet. That moved Thomas to No. 3 on the all-time chart behind record holder Shawn Watson and Leonard Jones. The senior from Woodstown, New Jersey, is also ranked third nationally in the triple jump and took over that spot on the list following his effort of 15.18m (49-9¾) this past weekend. Thomas is the first athlete from Delaware Valley to earn a National Athlete of the Week honor from the USTFCCCA. Wadeline Jonathas is back at it again. This past weekend at the New England DIII Championships, Jonathas lowered her own NCAA DIII record in the 100 with a wind-aided time of 11.41. Her previous PR was 11.50. Jonathas also won the 200, long jump and helped out on the winning 4×100 relay. This is the ninth time that Jonathas has been named National Athlete of the Week by the USTFCCCA dating back to last year, including twice during this outdoor circuit. Markim Felix had one of the finest weeks in the javelin of any athlete in the nation, as the freshman from Marlmount, Grenada, posted the top NJCAA Division I mark with a toss of 76.29m (250-3). His throw was the second-best mark of anyone in the nation in the event on the weekend, while three of his other throws in that series were in the top-seven on the week. 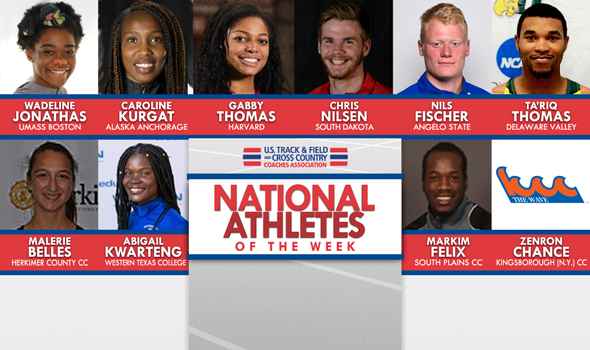 This is Felix’s first National Athlete of the Week honor, and the second for a men’s athlete from South Plains CC this season. Felix joins Fabian Edoki (March 27) as having won awards from South Plains CC this outdoor season. Abigail Kwarteng notched an event-title winning 1.87m (6-1½) in the high jump at the Texas Tech Masked Rider Invite this past weekend, putting herself atop the NJCAA Division I Descending Order List. As a matter of fact, no one in the nation had a better high jump mark this past weekend than the native of Ghana. Kwarteng also finished third in the triple jump at the meet with a leap of 12.15m (39-10½). This is Kwarteng’s third National Athlete of the Week honor this season, as she also picked up the award on March 27 and April 10. Zenron Chance notched the top time in the 400 hurdles in NJCAA Division III this past weekend at the Tom Farrell Classic. With a time of 56.27, the native of St. Vincent & The Grenadines placed first in the event out of a total of 18 competitors. This marks Chance’s first National Athlete of the Week honor, and he becomes the first man from Kingsborough CC to win the award this season. Malerie Belles posted not one, but two top-two NJCAA Division III marks this past weekend at the NJCAA Region III Track & Field Meet. The native of Clay, New York, recorded a 1.52m (4-11¾) in the high jump, which sits just under an inch behind the national leader. Belles also scored 2,074 in the heptathlon. Both marks were good for event titles at the meet. This marks Belles’ first National Athlete of the Week honor, and she becomes the first track & field athlete – regardless of gender – to win the award from Herkimer County CC during either the indoor or outdoor track & field seasons.